I’ve been actively engaging people in missions since boyhood. As a youngster, my parents dressed my brother and me in flowy, traditional Arabic outfits as we traveled to the local churches raising support for our middle-eastern missions. In the 70’s & 80’s, my teenage brother and I cold-called churches from a closet “call center” to see if they had a heart for supporting Scripture material distribution. Fast-forward to today, where communication is vastly more complex. Missions has evolved into a multifaceted mosaic of variegated platforms and paradigms. The ubiquity of the Internet and globalization nullify the attraction of the “strange” Arabic outfits. And with causal giving on the rise, how are churches and organizations supposed to successfully find, cultivate, and serve 21st century ministry partners? Many instances in Scripture clearly provide the pattern of progression that ideally ends in the fullness of the Gospel. The heart of moving people from encounter to engagement and beyond is looking to the end game. Every encounter ought to bring a person to the fullness of the Gospel by helping them realize their identity and inheritance and how to live in the fullness of it. We see this progression clearly outlined in Acts 26:17-18. In Acts 26, Paul masterfully exemplifies an apologetic progression through these stages. Paul was in prison—in chains! Yet he has an encounter with King Agrippa, a mighty man from the palace, rich beyond imagination, who had everything a man could want. Paul assesses and adapts to the culture he is addressing (Agrippa) in order to bridge a seemingly insurmountable gap, not only in station, but in belief. He offers up a dynamic equivalent and uses the idea of concept fulfillment to not only present King Agrippa the Gospel message, but engage him in moving to the next level. Now take a look at Jesus’ encounter with the Samaritan woman at the well in John 4. There was an automatic rift between Jesus—with his Jewish—and this Samaritan woman. There was no common ground to move this encounter to engagement or beyond, much less endear her to Jesus’ message. Yet Jesus sees the context, employs the dynamic equivalent of water, and leverages the conversation to common ground. He opens her eyes when she asks for water and he tells her he can give her more than water, something that will ensure she never thirsts again. Like Paul jolting Agrippa to see his dire spiritual poverty and Jesus uncovering the true identify of the Samaritan woman, our goal is to see people. If you try to skip that part, then you’ll be as ineffective as the guy on the corner wearing the “End is Near” sign or as off-putting as the telemarketer that doesn’t get your name right. Your words echo the disposition of your heart. Cultural, contextual and relational sensitivity is your bridge to relational equity. 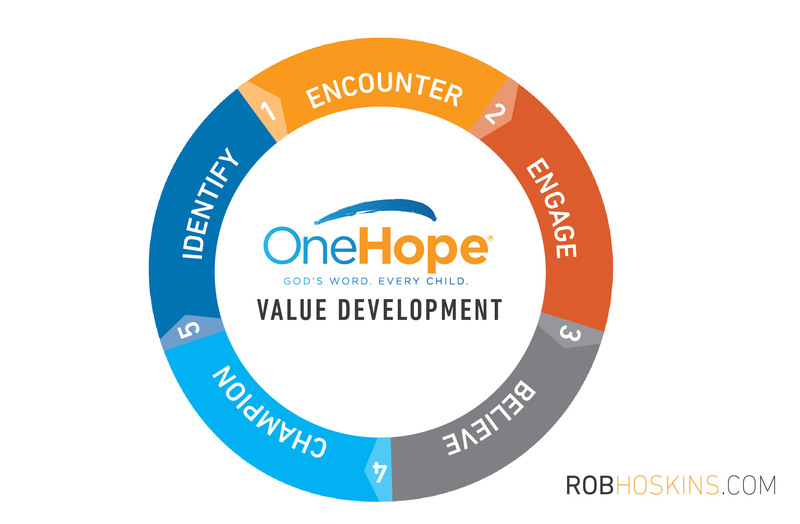 At OneHope, we are looking for people who have the same mission as we do; people who love kids and love the Gospel. We’re not trying to make every single person we meet a OneHoper, just find those whose fulfillment of life lines up with our mission. That takes encounters and engagement, then the continued work of walking alongside people to help explore God’s calling on their life, and how they can actualize it—whether it’s through OneHope or a local church, NPO or another avenue of the body of Christ. Not everyone will be like the Samaritan woman, instantaneously transforming and becoming a champion calling others to Jesus. But there are some who will move through the stages more quickly than others. One time there was this guy who saw an annual fiduciary assessment of our ministry posted on our social media. He showed up at my next speaking engagement and invited himself to dinner with me and the pastor. It was a little unorthodox. How are you preparing to help those you encounter realize their calling and actualize it?